Home » Blog » The Big Picture – GST Constitutional Amendment Cleared: What’s the Road Ahead? The Big Picture – GST Constitutional Amendment Cleared: What’s the Road Ahead? GST Constitutional Amendment Cleared: What’s the Road Ahead? With Rajya Sabha and Lok Sabha passing the GST bill unanimously, it is a first step towards the biggest tax reform measures in India post 1991. As GST is a constitution amendment bill, the next step will be states ratification. The process and steps to be taken legislatively, legally, technologically and politically have to be charted out post the President’s ratification. The GST has a concept of common market. The constitution of the GST council will happen only after 50% of states have passed bill, it will be sent to President and the President ratifies it. Once the council is formed, the GST rate will be negotiated by the centre and the states. Does such situation has a precedence? GST being a constitutional amendment bill follows the same process as other constitutional bills. But, no constitutional bill has yet seen any such constitutional set up. It is a new set up specific to the GST bill where the council consisting of Union finance minister and finance ministers of the state will discuss issues concerning GST. The GST bill has seen many disruptions in house, particularly in Rajya Sabha and hence was delayed. Yet, the disruption in house has brought forward a GST bill with better inputs. It has achieved a consensus which was eluding it earlier. The 1% levy by the manufacturing states as proposed by government has been dropped and the opposition party dropped the idea of giving GST a constitutional limit. So, the disruptions made sure that non-beneficial policy decisions were removed. The concept of GST council sitting and deciding the separate GST tax rates for centre, state and interstate is unprecedented. Hence with many elements involved, there is bound to be more delay as people will disagree and defer. It is going to be complicated as it has to be decided how the central and state governments are going to retain their ambit of goods and services. Certain products have been kept out of GST right now (liquor and petroleum). The predominant issue will be the GST rate only. At present, the states are looking at revenue losses which they would like to recover at any cost. If the states maintain higher GST rates to protect their revenue requirement, it will be self-defeating. Another challenge will be the state compensation. For now, there has been 100% compensation for revenue losses of states for next five years. The problem is that centre has to arrange for requisite pool of funds to compensate states cent percent for next 5 years. Thus, there needs to be a reasonable systematic process to decide on the compensation and should not be based on negotiations. Another important challenge is integrating diverse tax administrations. The problem is not only at government end but also at assesse end. The accounting system is built on old tax structure like sales tax, VAT etc. Thus, there is lot of work at the corporate level in redesigning it. When the GST bill finally comes up before the house, whether the bill should be a money bill or finance bill is to be decided. A former Union Finance Minister has asked for assurance from the government that GST bill should not be a money bill but a financial bill. Rajya Sabha cannot vote on the money bill and thus, it will not be fair debate. For a financial bill, the Rajya Sabha has the right to vote on the bill. There is a huge industry of sales tax consultants, CAs, retired officers of tax department. GST will also effect it. Thus, there will be expected delay. Politically it might become challenging as important elections are due next year. Hence, the government and opposition parties have to come together to make GST bill a law. However, there is expected to be a willingness to postpone the GST rollout post elections. Earlier, services were included bit by bit. But now, GST says that if there is a sales transaction, there has to be a tax. Thus, GST is a consumption-based tax. Ofcourse, there will be scope of tax avoidance and evasion, but atleast, all are included inside the scope of GST act, theoretically. There will be certain exemptions like poor people, small manufacturers etc. Sales tax at the state level is a huge source of corruption. Excise inspectors, octroy inspectors have had a field day in service. And if GST is implemented, it will go. From the wholesaler to the retailer, there is huge backend/non-recorded trade. The traders will be brought into the tax net. The small traders were not included earlier due to complexity of accounting, volume of data. With GST, all such discretion is gone. Even consumers discretion will go now with no option of not taking the bill and paying less. The big advantage of GST is that it removes different taxes on different products. Bulk of state’s income comes from liquor and petroleum but 90% of the industries fall out of it. So, it makes life better for producers of goods and services. First option has been ruled out. 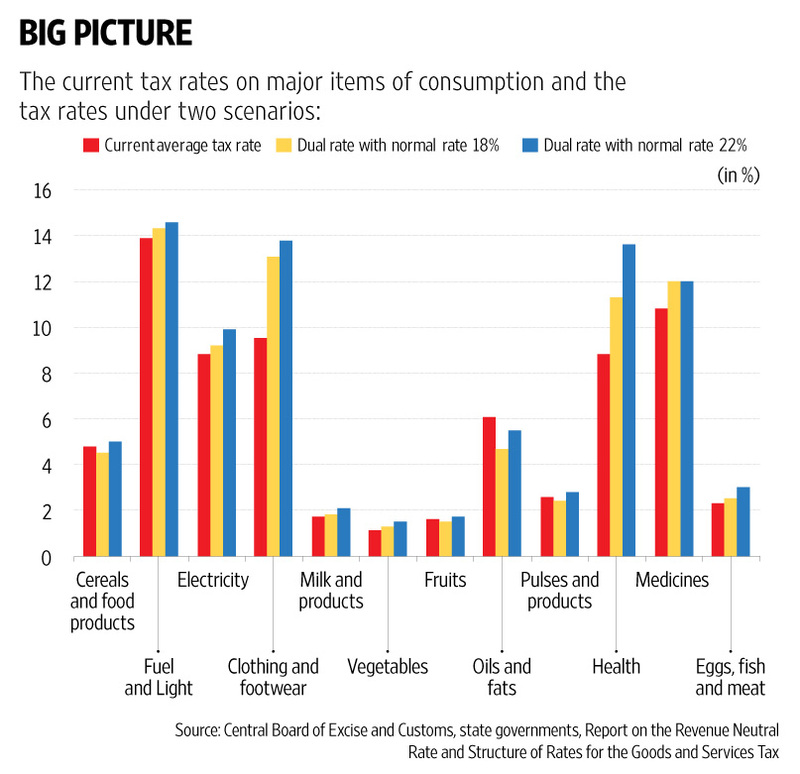 55% of CPI basket (majorly agricultural products) is exempt from GST, 30-35% will be taxed at lower rate and only 12-13% will be taxed at normal rate. With time, the inflation will be neutralised. However, essential items like health services and medicines will bear the brunt, whether GST rate is capped at 18% or 22% as the current service tax @15% will be increased. Everybody agrees that GST will be advantageous for the country but before it happens, there will be a lot of complications that will arise which will have to be tackled on political, administrative, economic and technological level.